Mood Rings. Color your Mood Ring Stone allows you to see yourself in a new colorful way. Mood ring colors are emotional. Your own energy will cause the stone to change color to reveal your inner emotions. Relax, give the Stone time to warm up to your inner emotions. Avoid getting ring wet. Black: Tense, Nervous, Harassed, Over Worked. Each box also contains 36 color charts. 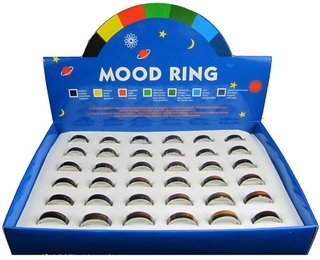 Also Available: One Mood Ring for $6 with free shipping.